Duck & Rice Kibble is a wholesome and natural hypo-allergenic dog food for loose bowels and for calming itchy and irritated skin. Using a mixture of valuable ingredients to create a pure and complete dog food, providing for all dietary needs. Duck provides protein and is easily digestible; organic oats provide fibre, again brilliant for digestion. Finally, for added health benefit, there is seaweed, alfalfa and yucca. Brown rice (39.7%), duck meal (15.0%), white rice (14.6%), naked oats, whole linseed, duck gravy (2.9%), duck fat (2.4%), alfalfa meal, pea fibre, chicory pulp, seaweed (0.5%), omega oil supplement*, potassium chloride, sodium chloride, parsley (0.125%),nettles (0.125%), taurine (0.1%), chicory extract (0.1%), calcium carbonate, glucosamine (0.045%),yucca extract (0.02%), chondroitin (0.005%). Protein 19 %, crude fibres 3.7 %, fat content 9.3 %, crude ash 4.8 %, Vitamin E 400 mg/kg, omega-3 fatty acids 1 %, omega-6 fatty acids 2.1 %. Additives per kg: antioxidants: E306/Natural antioxidant. 189 mg, Vitamins: E672/Vitamin A, 15000 iu,E671/Vitamin D3, 1400 iu, taurine: 1000mg. Trace elements: E1/iron, 133 mg E2/iodine, 2.2 mg, E4/copper, 20 mg E5/manganese, 40 mg, E6/zinc, 385 mg, E8/selenium, 0.29 mg. 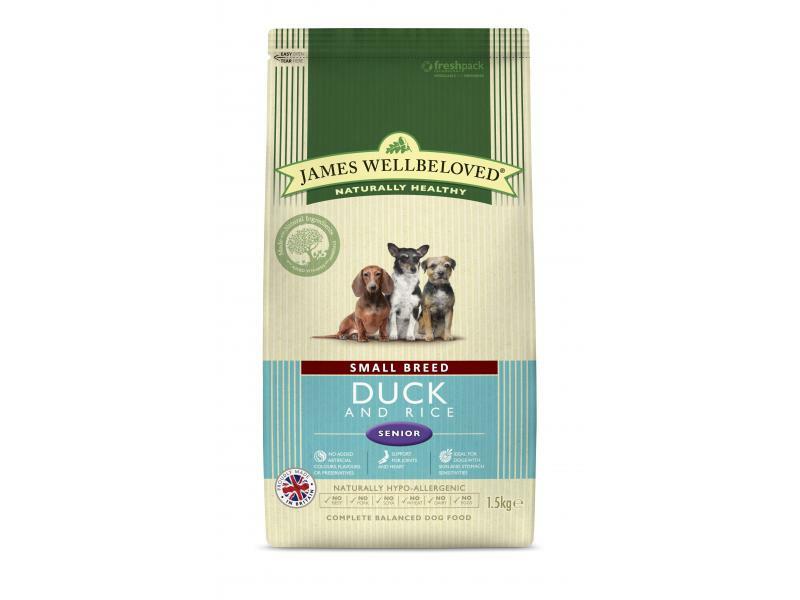 There are currently no questions for James Wellbeloved Senior Duck and Rice Dog Food - be the first to ask one!